Irritation and inflammation of the gums. Persistent bad breath that other people can notice. Oral pain that affects your sleep, appetite, study time, and productivity. Alignment issues due to tooth loss. Potentially severe health problems in the rest of your body. As you can see, you shouldn’t ignore tooth decay, as it is a major problem. Keep reading to learn how to prevent tooth decay while ensuring the health of your gums, teeth, and smile. Brush and floss on a regular basis. One of the best ways to prevent tooth decay is to brush and floss your teeth. The general rule of thumb is that you should brush your teeth twice a day and floss at least once daily. Make sure you’re using a toothpaste that contains fluoride, as fluoride helps fight tooth decay by making your teeth more resistant to acid attacks from the sugars and plaque bacteria in your mouth. Consider investing in a mouth rinse. Some people are more at risk for tooth decay than others, usually due to genetic factors or a poor oral health routine from the past. It’s recommended that if you’re one of these people, you should use a fluoride-containing mouth rinse in addition to brushing and flossing. Some foods are much worse for your teeth than others. Sweet treats and salty snacks often get stuck in hard to reach places on your teeth and directly contribute to tooth decay. However, snacks such as fresh fruits, crunchy vegetables, unsweetened tea, and sugar-free gum increase the flow of your saliva and helps your mouth naturally clean itself. 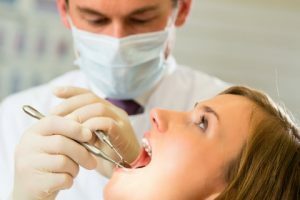 Even if you follow these three tips, you’ll still need to see a dentist on a regular basis for preventative care measures such as deep cleaning and check ups. Ready to make your appointment? Call us today.